FAYETTEVILLE – Headed into week two of competition, the 11th ranked University of Arkansas softball team is looking forward to a few games in the sun, when they face North Dakota State, #5 Washington, Northern Colorado, and Sacramento State as a part of the Puerto Vallarta College Challenge in Puerto Vallarta, Mexico. In its fourth year of existence, the PV College Challenge was first held in 2015, and again in 2017 and 2018. The games that took place at the 2015 event were the first fastpitch games in NCAA history played outside the United States. The Razorbacks found themselves up two spots in the national polls after an undefeated visit to Lake Charles, where Arkansas claimed wins over Campbell, McNeese, Samford, and Lipscomb. The Hogs now sit at #11 in the ESPN.com/USA Softball poll, #12 in the USA Today/NFCA poll, and #12 in the Softball America poll. Freshman Maggie Hicks had an outstanding weekend, riding a .462 batting average and five-game hit streak right into Puerto Vallarta. Senior Ashley Diaz follows Hicks with a .438 average at the plate, unloading four doubles and recording eight RBI at the Cowgirl Classic. All games played at the Puerto Vallarta College Challenge are available vie live stream on FloSoftball. 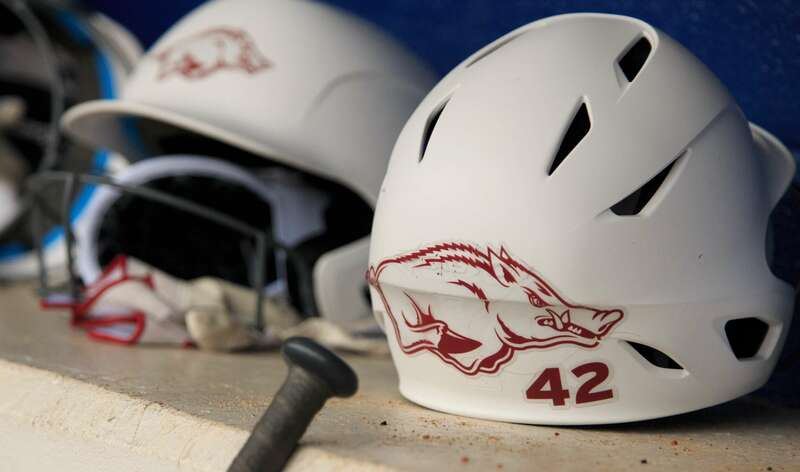 Link to the live stream and live stats available on the 2019 softball schedule at ArkansasRazorbacks.com. Game 1: North Dakota State | Thursday at 3 p.m. The Bison travel to Mexico with a 3-1 record in tow, with its only loss to Texas State in 10 innings. This will be the seventh meeting between North Dakota State and Arkansas, the series tied at three wins a piece. North Dakota State right-hander KK Leddy recorded her second career double-figure strikeout game with 13 against UTSA, Leddy notched four shutouts last season and has seven in her career. At the plate, the Bison look to Madyson Camach, who is good for .400 at bat with six hits so far this season. Collectively, the Bison are batting .234 with a 4.75 earned run average and are fielding at .960. Game 2: #5 Washington | Thursday at 8:30 p.m.
Last weekend, Washington went 4-1, including a win over #19 Baylor. The Husky made only two errors all weekend, while three different Huskies drove in at least three runs over the five games. Washington has run up a 60-4 non-conference record in the regular season over the last three seasons. Senior right-hand pitcher Taran Alvelo recorded her 600th career strikeout over opening weekend, Alvelo boasts a 0.55 ERA through 16.1 innings pitched with 13 strikeouts and 13 hits. Washington’s top batter through five games is Sis Bates- Bates is batting .526 with 10 hits in 19 at bats. Teammate Silentrain Espinoza has a team-best average of .556, appearing in three games, recording three RBI on five hits. Arkansas and Washington have met twice before with both games falling in favor of the Huskies. Last season, Washington rounded out a 52-10 campaign with a trip to the WCWS Championship Series, dropping a two-game sweep to Florida State. Game 3: Northern Colorado | Friday at 3 p.m.
UNC started the season at the Aggie Classic, hosted by Texas A&M, going 1-4 in the tournament. UNC defeated California Baptist 6-1, while dropping both games against the Aggies and North Texas. Early in the season, Northern Colorado is currently second in the Big Sky with three home runs. The series between Arkansas and Northern Colorado dates back to 2008- the two teams have met five times, with the Hogs winning all but one. Their only loss to the Bears came in 2009, when Arkansas dropped a 6-2 decision in Stillwater, Oklahoma. Since, the Razorbacks have shut out the Bears 10-0 across two wins during the 2018 Razorback Invitational. Game 4: Sacramento State | Saturday at 3 p.m.
Sacramento State won both the Big Sky Conference regular season and tournament championships a year ago and was unanimously selected to finish first in this year’s preseason coaches poll. Sacramento State has not beaten a nationally ranked opponent since March 24, 2009, when it defeated 12th-ranked Cal at home in eight innings by a 2-1 score. Since that victory, the Hornets have dropped 18 straight games against nationally ranked teams. Sacramento State is batting .367 while averaging 7.8 runs per game. The Hornets rank among the top 30 teams in the nation in seven different offensive categories. Five different Hornet regulars are hitting better than .400, including Katie Vretzos (.563), Nene Alas (.529), Mo Spieth (.462), Shea Graves (.444) and Krystal Aubert (.412).